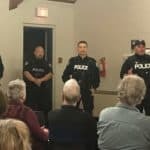 Police officers from the Community Response Team spoke to us at our Annual General Meeting on Apr 3, 2019 on crime issues in our community; SAHRA reported on their involvement with the Community Police Liaison Committee; we discussed how to report crimes or suspicious behaviour; and we talked about prevention techniques. The Upper Avenue Community Association (west of Avenue Road) and SAHRA (east of Avenue) Road have organized a joint session about crime in our area. If you live between Highway 401 to the north, Lawrence Avenue to the south, Yonge Boulevard /Yonge Street to the east and Bathurst to the west, please plan to attend. Bedford Park Residents Organization and Lytton Park Residents’ Organization members have also been invited to attend although the statistics are particular to the Bedford Park-Nortown area and 32 Division. However, there are many similarities between the four areas and the prevention techniques are common to us all. The Police will be presenting on preventative measures you can take to protect your home and family. Beware of bitcoin requests, phishing and other customer scams. Toronto Hydro is seeing a significant in rease in reports of fraud. Criminals posing as Toronto Hydro employees have developed aggressive phone, email, text and door-to-doors scams designed to trick customers out of money and/or personal information. Often they mask their phone number so that it appears to be Toronto Hydro calling. Toronto Hydro never threatens to disconnect power immediately. Toronto Hydro does not accept Bitcoin, any cryptocurrency or pre-paid credits cards as a form of payment. Hang up on any suspicious calls. Don’t click on any links asking you to accept electronic transfers. Ignore requests for personal information. Never make payments related to “Smart Meter Deposits” (it’s not a real charge). Another incident – a member within SAHRA’s boundaries reported on the morning of March 4th that their car had been entered and the glove compartment was found open. The resident noticed fresh foot tracks up the driveway in the snow that fell the previous evening. Snow had been brushed off the car’s handle and window on the driver’s side. Please try to remember, even when rushed or unloading, to make sure that your car is locked. Sounds like there are some good non-technical deterrents – steering wheel club, boot lock, parking in the garage. Search Amazon for “Faraday bag for keyfobs” for a variety of products with various features in different price ranges. A SAHRA member wrote to us about a scam they encountered in our Neighbourhood. It involved a supposedly empty car blocking in their legally parked car. When the owner tried to move their car, three men appeared, accusing the owner of damaging their car and demanding payment. It is recommended that you call the Police if this should happen to you. A SAHRA member wrote to us today asking that we alert the neighbourhood that at around 5:00 am Tuesday, Feb 19th there were 2 males walking down Elm Rd towards Felbrigg going from vehicle to vehicle trying to open doors. Their security company sent them footage of the brazen attempts. Please remember to not leave anything in your car and to lock your car doors. If you see any questionable activity, please report it to 32 Division (416-808-3200). The same password should never be used on every online account for security reasons. If one of the accounts is compromised, they’re potentially all in danger. Perhaps you should consider using ‘password manager’ software. A Toyota Highlander was stolen recently from a house near the intersection of Delhi and Belgrave. Toronto Police have revealed that there were about 1,000 more vehicles stolen in 2018 than the previous year. Lately, luxury brands such as Lexus, Mercedes and Land Rover were the main targets. Toronto Police has a website specific to auto theft. The link provides good information on how to reduce the risk of vehicle theft. Toronto Police report that there have been several incidents where twigs were placed between the door jambs and the doors of residential homes, for both house doors and garage doors. This method is used to determine if the residents of a home are away – if the twig remains caught in the door, no one has opened it and thus it is an indication that the door has not been opened and no one is home. If you find a twig or some other item caught in an external door at your home, you should let the police service know. In order to reduce the number of deaths caused by drunk driving, there have been changes made to the criminal code to allow police to demand a breath sample at the roadside of any driver lawfully pulled over. Toronto Police are using this new tool. They are also implementing the R.I.D.E. (Reduce Impaired Driving Everywhere) programme at different hours during the day rather than just focusing the stops at nighttime. An interesting article on the rise in auto thefts in the Toronto area along with a security expert’s opinions on why and what we have to do to prevent the theft. SAHRA Directors have applied and been accepted to join the Community Police Liaison meeting. The Toronto Police website contains information and pamphlets on various Crime Prevention topics. Links are provided to the following pages – you can obtain information on subjects such as Break & Enter Prevention, Apartment Security, Personal Safety, Frauds & Scams, etc. “Did you know that the most common threat to your home while you are away on summer holidays is burglary? Typically burglary is a non-confrontational crime but being victimized can leave a family feeling vulnerable and violated. What follows is a top 5 list of suggestions from Protectron to minimize your risk by making your home unattractive to potential burglars. The first step, is to “harden the target” or make your home more difficult to enter. Most burglars enter via the front, back, or garage doors. Burglars know to look inside your car for keys and other valuables so keep it locked, even inside your garage. Use high quality Grade-1 or Grade-2 locks on exterior doors to resist twisting, prying and lock-picking attempts. When vacationing, leave a car in your driveway or arrange for a neighbour to keep a car there and move it around from time to time. Have someone mow your lawn, rake leaves and pick up your mail while you’re away. Home security systems play a crucial role in a home security plan and are very effective, if used properly, especially when monitored 24-7 by ULC-listed monitoring centres. Home security systems need to be properly installed and maintained to be most effective. Your home security system should include a loud inside alarm, detectors on all exterior doors, and motion sensors in the master bedroom and main living areas. More than 300 residents gathered at the Lawrence Park Community Church in February, 2018 to voice their concerns to the TPS officials in attendance, including Chief Mark Saunders, Superintendent Rob Johnson, of the 32 and 33 Division, and senior officials from the 53 Division. Chief Saunders highlighted the new strategy to modernize policing in the City of Toronto. For example, TPS division boundaries are currently being reconfigured to align with neighbourhoods and streamline resources. In Ward 25, the divisions bordering Bayview Avenue will be consolidated to better serve the community. Contact your respective divisional Crime Prevention Officers for assistance in developing a customized home security strategy. Above all, the TPS representatives emphasized the importance of community cooperation and reiterated their commitment to proactive policing in our neighbourhoods. You should report any suspicious activity you observe, as the police use reporting data to direct resources. We live in a safe and friendly neighbourhood, and it is very easy to become complacent about home security. But, even in the SAHRA neighbourhood, break-ins do happen. With the holiday season ending and our return to a steady routine (which thieves love), here are some brief thoughts and suggestions on home protection to consider. 75 percent or more of break-ins happen during the day. Thieves don’t want to be confronted – they are looking for a quick in and out. They may be monitoring the activity on a street to see when people leave and return. Nannies or parents may not lock every window or door in the house for the short time it takes to drop off or pick up kids from school. Even 10 minutes gives a thief enough time to execute a costly break-in! Burglars will stake out a house for days, studying the owner’s patterns. They can be middle aged or older, male or female and dressed to fit into the neighbourhood. Their accomplice may be in car nearby. They may pretend they are reading meters, meanwhile they are surveying the street. Most construction crews are hardworking and honest, but there may be the temporary construction employee working for a builder and noting the habits of the neighbours for a future break-in. Some thieves drive up and down streets looking for large discarded TV or computer boxes in the trash….advising them of new electronics in the house. Use box cutters and place them in your blue box out of site. Lock you doors, even when you are at home! While you are raking in your back yard – lock your front door and garage door. The suspect can quickly grab your purse, wallet or car keys if you leave them by the front door. If they have entered your house and you see them, they may fake an illness or say they are lost and are in the wrong house. Note their description, and as soon as they leave, call 911. Watch for where they go and look for their getaway car. Burglars look to see if you’re home and look for a point of entry. Remove any potential hiding places. Big bushes in front of a window give the robber opportunity to hide and perhaps the opportunity to wrap a rock around his jacket and quietly break the window gaining access. not just a windowpane secured by a simple trim. Install sensor lights high enough that a burglar can’t easily unscrew the bulbs. Use deadbolts on all your doors. It does mean you need a key for the inside and the outside to unlock your door, but it deters a break in. Condo owners need to lock their doors and windows too. A burglar can climb to an unlocked balcony door and let themselves in. Keep burglar alarm stickers fresh. Faded stickers signal a non-functioning or non-existent alarm system. Old storm doors will break under the force of a strong shoulder, so make sure your doors are solid. Sliding doors are especially easy to break into so install a metal riser along the bottom or put a latch to lock track, so they can’t be lifted out. For bigger windows and sliding doors, use decorative bars to avoid break-ins. A skilled burglar can use a pin or a credit card to open up most cheap locks. Motion detectors need to be carefully positioned to be effective and most aren’t. Most of them don’t scan the foot and a half closest to the floor, so a robber can crawl on his stomach and pass by undetected. Make sure your detectors are aimed at the floor and position one at the foot of the stairs, which will keep the burglar to just one floor. Motion detectors cannot detect movement behind hiding places such as bushes and trees. Include garages in your home security. They contain lawnmowers, tires rims, bikes, motorcycles, cars. Passage doors and overhead doors should have the same level of protection as the entrance doors to your house. Once inside the garage, the criminal is out of sight. Just like when using your pin number at a store, cover your entry code when opening the garage door or house. Do not give free roam to contractors and their assistants. Remember that shed and detached garages may have valuable tools that need to be locked. Do not keep valuables in your vehicles. This includes smartphones, GPS, etc. thieves will break into it even if you haven’t left anything valuable there. Don’t leave the car running on those cold, snowy days. Do not announce on FACEBOOK that your entire family is going on vacation. Somewhere you may have a photo of your house, your address, all kinds of details that thieves look for. If you are a collector, avoid proudly exhibiting the display near the window. Thieves look for wedding announcements and have been known to steal all the gifts during the date and time the family announced they are celebrating elsewhere. The first place robbers go is to the hallway or kitchen looking for wallets, keys, etc. and then to the master bedroom for money, jewellry and other valuables. Place your valuables in a safety deposit box. Be aware of your neighbourhood. Who is coming and who’s going. When you go on vacation, inform a neighbour of your departure and return dates. Place a hold on your newspapers. Where possible, cancel all deliveries. Arrange to have the lawn cut and walkways cleared. Use timers to activate lights at various intervals. Have a neighbour pick up mail. For all the technology we use to keep us safe, sometimes the best deterrent is a watchful community. That’s why it’s important for SAHRA families to know your neighbours!